Local arts agencies, state arts agencies, arts funders supported through voter tax initiatives, and united arts funds are grappling with how to cultivate a twenty-first-century cultural community that reflects changing demographics, encourages innovation, embodies equity, and ensures a robust donor base and public commitment to the arts. Through interviews with sixteen leaders of public arts funders and united arts funds, Recalculating the Formula for Success: Public Arts Funders and United Arts Funds Reshape Strategies for the Twenty-First Century documents the new ways that these funders are approaching their work, rethinking longtime practices, and adapting to changing environments. Public arts funders and united arts funds experiment with new strategies. All of the interviewed funders are going beyond their traditional mandates to help transform legacy institutions, nurture the next generation of arts organizations, and cultivate a cultural establishment that fully embraces and serves all parts of their communities. The range of new initiatives undertaken by these funders encompasses priorities such as community development, cultural equity,1 arts education, and cultural planning. Often these initiatives are being supported through new sources of funding. Funders move away from an exclusive focus on size when supporting legacy institutions. Most of the public arts funders and united arts funds interviewed for this report continue to provide large shares of their giving as operating support to major legacy cultural institutions reflecting a European cultural tradition. Yet, many have retooled their funding formulas to incorporate criteria beyond organization size. Interviewees reported that they increasingly require evidence of community benefit, good financial stewardship, and even commitment to equity and have made grant review processes more rigorous. Community demographics, evolving audience expectations, and the need to nurture newer and smaller organizations are among factors driving change. Public arts funders and united arts funds are generally the largest arts and cultural funders in their communities and states. Given this role, they are increasingly focused on how their giving reflects often rapidly changing demographics, serves the needs of historically underrepresented community members, and supports organizations that are engaging the interests of younger and more diverse audiences with more participatory, community-based cultural experiences. Several funders are also addressing the needs of artists to ensure that they can continue to be a part of their evolving communities. Board leadership is critical to funder innovation. A few boards have sought out new leadership to implement evolving ideas about how funds should be distributed. But, according to interviewees, it has generally been staff who have helped boards and government officials to broaden their thinking about funding priorities, drawing upon the perspectives and critiques of their community members and donors. In many cases, a focused transition in board composition and thinking has been an essential step in bringing about changes in funding strategies. These transitions have often included reductions in overall board size and intentional efforts to reflect the diversity of the community. Continuing funder evolution may challenge long-standing relationships with community partners and others. To ensure the health and longevity of the arts and cultural sectors in their changing communities, public arts funders and united arts funds are having to ask questions that may not be comfortable for some in the community, such as the following: What is the trade-off between providing formula-based support for legacy institutions versus accelerating the growth of small and midsize arts groups that reflect changing community interests and demographics? What are the costs to the community of not supporting cultural equity? If we as the largest area arts funder do not intentionally cultivate the next generation of diverse arts organizations and audiences, who will? To understand the evolving strategies of public arts funders and united arts funds, Grantmakers in the Arts identified a geographically diverse set of sixteen funders for interviews, including local arts agencies, state arts agencies, arts funders supported through voter tax initiatives, and united arts funds. (For a complete list of interviewees, see “Interview Participants.”) The author conducted confidential interviews with leaders of these funding institutions between August and September 2016. Prior to initiating these interviews, the author reviewed publicly available information on these and nine additional public arts funders and united arts funds to understand their current giving priorities and evolving strategies and funding formulas. Resources accessed for this review included funder websites, annual reports, financial statements, grants lists, and IRS Form 990 information returns. Everyone is experimenting. Everyone is asking questions. Everyone wants to know what is working elsewhere that they can try. Some have moved away from formula funding. Others are changing up the rules for legacy institutions and expanding their rosters. Everyone is focused on how to keep their missions relevant to their evolving communities and supporters. Local arts agencies, state arts agencies, arts funders supported through voter tax initiatives, and united arts funds are often the largest institutional donors to the arts and culture in the geographic areas they serve. (See “Funder Definitions” for descriptions of each funder type.) While not typically considered together, these institutions share a number of similarities distinct from private foundations and corporate donors. These parallels range from having to demonstrate their value to an array of supporters — e.g., government officials, taxpayers, individual donors — to in most cases having a historical commitment to the formula funding model. Formula funding typically provides general operating support based on the size of the organization’s budget, leading to large shares of their funding going to major legacy cultural institutions.2 They are also all grappling with what is needed to cultivate a twenty-first-century cultural community that reflects changing demographics, encourages innovative practice and new ways of engaging with the arts, embodies equity and moves beyond nearly exclusive support for European artistic traditions, and ensures a robust donor base and public commitment to supporting the arts. 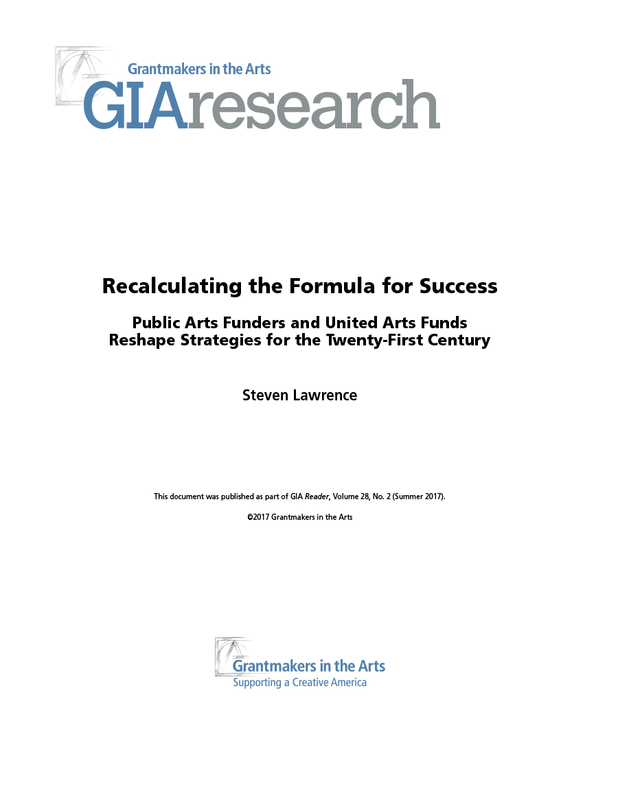 To begin to understand how public arts funders and united arts funds are responding to these challenges, Grantmakers in the Arts commissioned Recalculating the Formula for Success: Public Arts Funders and United Arts Funds Reshape Strategies for the Twenty-First Century. Through an analysis of publicly available information and detailed interviews with sixteen leaders of state arts agencies, local arts agencies, tax initiative funders, and united arts funds (see “Methodology” for details), this report documents the new ways that these funders are approaching their work, rethinking longtime practices, and adapting to changing environments. While not an exhaustive survey of all public arts funders and united arts funds, this report offers a first-ever study of how a set of these critical funders are thinking about their current realities and evolving roles and provides examples of numerous strategies other funders may want to consider as they assess their own future priorities. Local arts agencies: Provide funding for arts and cultural engagement in a specific city or region primarily through allocations from the local government. May secure additional funding from individual, foundation, or corporate donors or receive allocations from a voter-approved tax initiative. State arts agencies: Provide support for arts and cultural engagement within a state primarily through allocations from the state government and the National Endowment for the Arts (NEA). May secure additional funding from individual, corporate, and foundation donors or receive allocations from a voter-approved tax initiative. Tax initiative funders: Provide funding for arts and cultural engagement within a specific city, region, or state through allocations from a voter-approved tax initiative. May also function as a local arts agency, state arts agency, or united arts fund. United arts funds: Provide funding for arts and cultural engagement in a specific city or region primarily through funding from individual/workplace, corporate, and foundation donors. Driving the evolution of public arts funders and united arts funds are often dramatic changes in the composition, needs, and interests of the communities they serve. These transitions are by no means the exclusive result of demographic changes, although both ethnic and generational shifts were cited by a majority of the sixteen funders interviewed. Many of these trends also present implications well beyond the arts and cultural community. Following are some of the changes that funders are taking into account as they adapt their institutions and strategies to twenty-first-century realities. A number of funders spoke about the rapid changes in the ethnic compositions of their communities, with a couple characterizing them as moving from majority white populations to “the new American city” and the “most culturally diverse city in America” in very short periods of time. Moreover, within these new populations are numerous nationalities reflecting markedly different cultural traditions. In general, the existing cultural institutions — based largely on a European tradition — do not automatically speak to the cultural interests of these new residents. In fact, one leader specifically noted that these residents have their own arts and cultural traditions and would be disinclined to leave their communities to participate in cultural events at legacy institutions. Another commented that the cultural funding community has not kept pace with the scale and global diversity of the audience, and as a result there are growing inequities in the arts. Interest in helping to nurture an arts community that reflects a wider variety of cultural traditions went well beyond funders whose communities are experiencing dramatic demographic changes. Most of the interviewed leaders spoke about the need for greater cultural equity in their communities. For example, arts leaders in several communities with largely stable populations spoke about the lack of engagement of ethnic communities — generally African American communities — in the arts and cultural offerings of the European legacy institutions in their regions. For examples of how public arts funders and united arts funds are addressing these trends and other challenges facing their communities, see the section “Rethinking, Revising, and Reformulating Funding Strategies” later in this report. Public arts funders and united arts funds overwhelmingly see their role as being central to the well-being of the arts and cultural community in their area or state. “We’re the only organization in the region focused across the spectrum of arts and cultural organizations,” remarked one funder. This perspective was echoed by many of the interviewees, who spoke about their unique vantage point in facilitating a cultural community that is strong and vibrant. An analysis undertaken for this report of primarily 2014 giving by seventeen local arts agencies, united arts funds, and arts funders funded by tax initiatives reflected this concentration of resources (Figure 1). It found that most of these funders (fourteen) directed at least one-quarter of their giving to their top five recipient organizations.3 Just over one-third of these funders (six) directed more than half of their giving in that year to their top five recipients. Relative to other donor types, united arts funds were more likely to concentrate their giving among their largest recipients. In general, this funding represented unrestricted operating support, and these recipients typically included major symphonies, operas, theaters, performing arts centers, museums, and ballets reflecting European cultural traditions. But a number of these funders are also increasingly emphasizing that their support is providing value to all members of the communities where they fund. One interviewee spoke about their shift in mission four years ago to a focus on “serving communities versus funding arts for art’s sake,” while another reported that they have learned that community residents see the value of the arts as the “perceived ripple effects of economic vibrancy and social cohesion.” Even funders that feel the pressure to continue to prioritize the economic value of the arts to their communities understand that the way that value is being determined may be changing. When asked how their giving would change between 2016 and 2017, just over half of interviewees expected their giving to increase. The balance anticipated that their giving would remain level. At the same time, a few funders did signal that they faced challenging fundraising or political environments, which could affect their giving levels in future years. United arts funds also cited the breadth and reach of their fundraising as providing unique value to the arts in their communities. By pooling funding from large numbers of donors and being able to initiate workplace giving, they are raising funds on a scale that few individual organizations could manage. “There would be nothing to replace our support for the arts if our fundraising failed in some way,” noted one funder. These institutions also see these efforts as putting the arts in front of a much broader pool of potential participants and supporters. Similarly, a number of public arts funders and united arts funds emphasized their role in making the arts and specific arts organizations more visible in their communities. Through a variety of means, such as engaging in public grant review processes, including other funders on review panels, advocating for the arts among corporations and other donors, and serving as a “Good Housekeeping Seal of Approval” for grantees, they are helping to advance the arts community as a whole. As often the largest and most influential supporters of arts and culture in their communities and states, public arts funders and united arts funds are witness to all of the forces currently transforming the American arts and cultural scene. In response, they are moving beyond their traditional mandates to help transform legacy institutions, nurture the next generation of arts organizations, and cultivate a cultural establishment that fully encompasses and serves all parts of their communities. While taking different approaches and responding to unique social and political environments, all of these funders are cognizant of the critical need for their institutions to experiment, learn from others, and ultimately transform the arts. The sixteen public arts funders and united arts funds interviewed for this report evidenced changes in their funding priorities ranging from incorporating greater transparency into an established formula funding strategy, to creating funding opportunities focused on arts education and cultural equity, to entirely restructuring their grantmaking priorities. Beginning with an examination of funders who have undertaken the most fundamental change — the modification and, in some cases, complete restructuring of their funding formulas — the following priorities identified by interviewees offer a spectrum of ways that public arts funders and united arts funds are transforming their roles in their communities and states. Most of the funders interviewed for this study provide substantial shares of their giving each year to large, almost exclusively European-tradition arts institutions. The major museums, symphonies, operas, ballets, theaters, and performing arts centers are perceived as symbols of the sophistication and economic prowess of their communities. Often these institutions incorporate the name of their community in their organization name. They have also been characterized at times as “centers of excellence,” whose success “would ripple through the community and be your greatest return on investment,” according to one interviewee. The programmatic quality of many of these organizations remains exceptional. Providing support for these institutions has been a key priority for many public arts funders, with a formula prioritizing support for these legacy institutions built into their founding documents or determined by the expectations of government officials. One state arts agency leader noted that in addition to running an expansive competitive grants program, they are required to allocate a set share of their annual state budget allocation to twenty-five major legacy institutions. All the united arts funds were formed with the explicit intention of raising funds to support a select group of major legacy institutions. But even those interviewees most comfortable with their traditional funding formulas are expanding the number and types of organizations they support and changing expectations for how major legacy institutions demonstrate their value to the funder and the community. Others are effecting even greater transformations. Following are examples of some of these changes. Modifying the formula. Public arts funders and united arts funds are taking various approaches to how they create systems for distributing their operating support more broadly. One more recently established funder noted that their founding documents intentionally did not earmark funds for the largest institutions. But they do use mathematical formulas in “seeking to distribute dollars as independently and fairly as possible.” In their case, a large organization may be eligible for a “$1 million grant that is only 4 percent of its budget, while a small organization may receive a grant equal to 25 percent of its budget.” Similarly, another funder reported that their original formula was a sliding scale based on organization size, which they thought was common practice. But they discovered that organizations were adjusting their budgets to stay under the thresholds and, therefore, be eligible for larger grants. In response, they hired a statistician to create a “calculator” for determining potential grant size. Now, for example, an organization with a $10,000 budget could apply to have 43 percent of its budget covered, while one with a $40 million budget could apply for only up to 0.75 percent. A funder that recently moved away from a formula guaranteeing support for legacy institutions continues to maintain tiers based on organization size, but meeting new funding criteria is now the primary factor for receiving support. Moreover, the smallest organization in the tier can get the largest grant if they show that they are doing the best job of meeting the criteria. “I believe that helps break the logjam with small groups. Simply because they’re smaller there’s no reason they can’t be recognized and supported in a catalytic way if they meet our criteria.” One funder that eliminated their two-tier system offered a slightly different rationale for this change. In their community, they saw the legacy institutions receiving strong support from big donors and concluded that their greatest value would come from supporting the small and midsize organizations that the big donors do not support. Changes to funding formulas have not occurred without pushback from various community constituencies. Legacy institutions have been most likely to voice concerns about changes to funding guidelines that would reduce the amount of support they receive. But, conversely, smaller groups have also raised concerns that the changes made to longtime formulas by some funders have not sufficiently addressed inequities in eligibility requirements and how dollars are being distributed. Encouraging financial stability. At least some of the funders interviewed are making explicit efforts to promote the sustainability of arts and cultural organizations. For example, one funder will provide additional operating support to organizations that maintain some reserve or operate with surpluses. “We’re trying to provide incentives for them to be more sustainable and work less from a break-even perspective.” Another funder indicated that they had created a scorecard for assessing member organizations’ health based on a three-year rolling average of their financials. The funder determines 25 percent of their allocations based on their performance on the scorecard. Public arts funders and united arts funds interviewed for this report indicated a universal inter-est in connecting with and supporting diverse communities. As one tax initiative funder put it, “Any organization receiving public funds should get serious about meeting the needs of all communities.” Nonetheless, interviewees were at very different places in terms of levels of engagement — from undertaking multipronged initiatives to increase cultural equity to trying to determine the right strategy for beginning to build connections to diverse audiences in their communities. Several funders referenced the central role of the cultural community in establishing community cohesion. One funder heard this directly through community feedback. “The community literally said, ‘There is no other segment of the community that’s positioned to bridge difference like the cultural community. This must be your number one job.’ The community figured this out,” remarked the funder. “And this is a huge difference from ‘Oh, you’re here to entertain us.’” A couple of funders also emphasized that their engagement in supporting greater equity goes beyond ethnic and racial equity to encompass gender, age, disability status, veteran status, and sexual orientation. Public arts funders and united arts funds are rapidly and intentionally expanding their role in helping artists and arts and cultural institutions engage in communities to advance community development. These efforts range from supporting first-ever campaigns to promote cultural tourism and cultural festivals, to helping small and midsize arts organizations acquire permanent space, to collaborating on efforts to secure federal housing and transportation funding. The sixteen public arts funders and united arts funds interviewed for this report make use of a wide array of community feedback mechanisms for purposes ranging from assessing proposals to identifying community priorities. Several spoke about the value of engaging outside panels in reviewing grant proposals, which raises the profile of the arts and cultural organizations seeking funding and leads to panel members serving as “community ambassadors” for the work of the funder. Funders are also supporting legacy institutions’ efforts to go into communities and help groups meet specific needs. For example, one funder hired the ballet to teach ballet classes in schools. Beyond the benefits of providing arts education, they expect that this engagement will engender greater community appreciation for and identification with the institution. The rethinking and reinvention of funding priorities among public arts funders and united arts funds result from no single stakeholder or strategy. While a few boards have sought out new leadership to implement evolving ideas about how funds should be distributed, it has generally been staff who have helped boards and government officials to broaden their thinking about funding priorities and formulas, drawing upon the perspectives and critiques of their community members and donors. In nearly all cases, a focused transition in board composition and thinking has been an essential step in bringing about the changes in funding strategies that guarantee the relevance of public arts funders and united arts funds to their twenty-first-century communities. Following are specific examples of the catalysts that have propelled six public arts funders and united arts funds to adapt their funding strategies. The leader of Metro Arts, Jennifer Cole, related that one of the efforts involved in moving toward equity is addressing long-held practices in board appointments. Many city-authorized arts agencies have mayoral and city council oversight over board leadership. In Nashville, Cole worked over a period of four years with two mayoral administrations to alter the composition of her board. By working for one appointment at a time, Cole now has a board that is 55 percent people of color and gender balanced. It also includes a wide range of ages, religious and socioeconomic backgrounds, and neighborhood geographies. This transformation of board leadership has gone hand in hand with specific program outreach to all neighborhoods in the city and demonstrations of grant results in all thirty-five city council districts. The result is an improved relationship with the city council and citizens, who see the arts commission as representative of all residents and neighborhoods. This helps Metro Arts ensure that the arts drive a vibrant and equitable community. What a twenty-first-century community wants is a balance of institutions of established and emerging and start-up and participatory organizations. That’s what vibrant means today. All of the sixteen state arts agencies, local arts agencies, public funders created through tax initiatives, and united arts funds interviewed for this report have moved beyond providing formula-based support exclusively to a predetermined set of large, legacy cultural institutions primarily reflecting European traditions. Yet the priorities of these funders vary widely, from those that have incorporated a limited number of relatively newer organizations into their operating support programs but continue to make grants based primarily on organization size, to a few that have stepped away from formula funding and implemented fully competitive giving strategies. Most are in some way balancing ongoing support for legacy institutions with a wide array of new competitive funding opportunities for smaller and more diverse arts and cultural organizations that engage all parts of their communities. Each funder will need to decide on the exact shape and timing of its transition, but all are going to need to continue to adapt and evolve. As evidenced in the comments of the funders themselves, increasingly diverse communities want a cultural sector that reflects their traditions and interests and offers convenient access to artistic experiences. New generations of arts participants want to be a part of creating art, not just observing it. And donors increasingly want evidence of how the arts and cultural organizations they support are helping to build community cohesion and reflect and celebrate the entirety of the community. Does our board reflect the community we serve? Do our overarching funding priorities interest younger generations of donors? Or are we relying on niche activities to attract them to our traditional priorities? What is the trade-off between providing formula-based support for legacy institutions versus accelerating the growth of small and midsize arts groups that reflect changing community interests and demographics? What are the costs to the community of not supporting cultural equity? Would fully competitive funding enhance or diminish the quality and relevance of arts and cultural production in our community? Does offering a stable source of support to legacy institutions preclude requirements for greater responsiveness to changing community priorities? If we as the largest area arts funder do not intentionally cultivate the next generation of diverse arts organizations and audiences, who will? Cultural equity was the term most commonly used by interviewees to reference efforts in the arts and cultural community to address the historical underrepresentation and underfunding of racial and ethnic minorities, as well as people with disabilities, LGBT people, and other populations. In this report, the term legacy cultural institutions refers to large-budget entities, such as symphonies, operas, ballets, theaters, and museums, that generally reflect European cultural traditions. Public information on a total of twenty-one funders was examined for this analysis, including thirteen local arts agencies, five united arts funds, and three arts funders created through tax initiatives. However, the share of giving directed to the largest recipients could not be determined for four local arts agencies. Giving reflects 2014 fiscal information for most of the seventeen funders, with the remainder represented by 2013 or 2015 fiscal information. For more information on using contracting to support unincorporated organizations, see Jen Gilligan Cole, “Expanding Cultural Family: Funders, Tools, and the Journey toward Equity,” GIA Reader 27, no. 2 (Summer 2016).